Infinity scarves are the latest fashion trend! Now you can crochet your own infinity scarf with the Crochet Infinity Scarf Kit. Even if you are a beginner crocheter, this infinity scarf pattern is easy to follow and this kit provides you with everything you need to get started. Discover the latest must-have trend; the infinity scarf – a large, closed loop of crochet that can be worn in a variety of stylish ways! 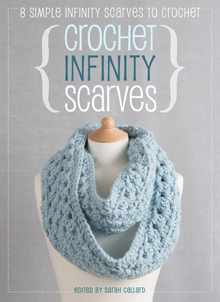 Now you can crochet your very own infinity scarf with this exclusive kit! Even if you are a beginner crocheter, this infinity scarf pattern is easy to follow and this kit provides you with everything you need to get started. Brought to you by a selection of talented designers, now you can crochet yourself an infinity scarf or shorter cowl with this must-have collection of new and original patterns. Be inspired to create a scarf for every season with a wide range of patterns, yarns and colorways, including pretty plaids and checks, chunky ribs, delicate lace crochet and a unique twist on the traditional granny square. Each project is easy to follow, even for beginners, and the handy technique section at the back of the book will allow you to brush up on your skills and get crochet clever! So whether you are looking for up-to-the-minute fashion ideas, a pattern for a chic Mobius Scarf or a contemporary take on a crochet classic, look no further than this essential collection. This lightweight, flexible plastic hook is comfortable to use and puts less strain on hands then aluminum styles. 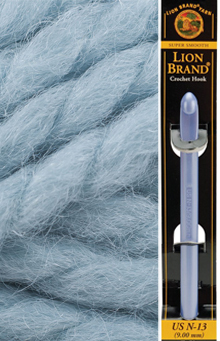 Wool-Ease® Thick & Quick® is the super bulky member of the Wool-Ease yarn family. It has the feel, warmth and softness of wool with the easy care of acrylic. It's an ideal beginner yarn. Order the Crochet Infinity Scarf Kit today!